How to make Air Cooler Efficient to get Cool Air all the times? Home » Home » How to make Air Cooler Efficient to get Cool Air all the times? Summers in India is considered to be the worst weather because the scorching heat of the sun does not allow you to move around. At home, if you do not have an efficient cooling system, it is going to be a nightmare, especially in the plain, northern part of India. The temperature in Delhi and nearby states goes above 47 degree Celsius. If you use an air conditioner, it is going to be an expensive affair. One AC can tax you at least Rs 4000/- per month extra. If you are not able to afford Air Conditioner, you can buy a cooler and make it more efficient. We are giving here below the Tips to use the Air Coolers efficiently. There should be proper ventilators in the room so that there should not be suffocation. Humidity in the room should not increase. Air coolers are different from air conditioners. In case of ACs you have to keep the room closed from all directions. But in case of air cooler, you have to keep proper ventilation in the room. You should keep the cooler in front of the window. If it is put behind the window then there should be a door or another window or ventilator for cross ventilation. In the hottest months like May and June, the hot air passes through the pads of the cooler and evaporates the water drops. Therefore, there should be ventilators for the extra vapors to get out of the room, to avoid too much humidification in the room. Keep the windows and the doors 1/3rd open. If you will open them completely, the room will not get cooled. Have lots of ice in the fridge. Put that ice in the cooler water tank. When you add ice to the water the pads in the three sides of the cooler get soaked with cold water. Hence, they also get cool and air passing through them becomes cool. The ice should not put in high quantity. You can not expect an air cooler to behave like an air conditioner. It can never make the room chilled as in case of acs. Before you start using the cooler, you should clean all the pads, water tank, and front grill. You should clean all these parts of the cooler every week. Get your air cooler serviced regularly. To make the cooler more efficient, you should switch on the water pump while adding the water to the tank. This way the pads get soaked with water before you switch on the fan. Starting the water pump a minute before the fan helps in blowing cool air. Today, everybody is buying online. Therefore, there is no better place than online to buy a good quality Air Cooler. 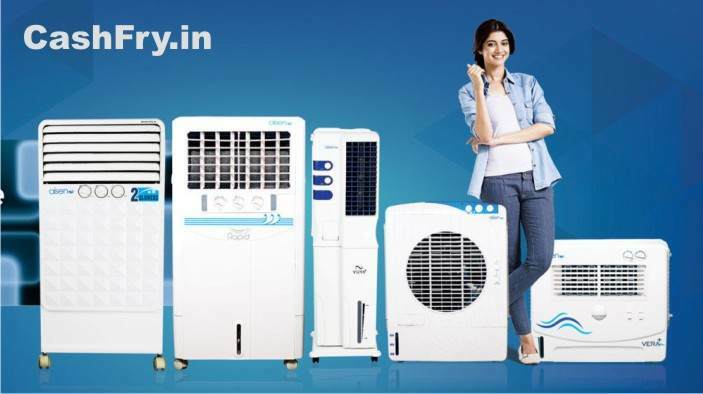 At Amazon.in, there are plenty of brands such as Symphony, Bajaj, Butterfly, Crompton, Usha, Havells, Kenstar, Orient etc. You can buy an air cooler as per your requirements. You can check out the size and capacity. We are giving here below the best deals at Amazon. You can buy air coolers at discounted prices with Amazon Promo Code India. 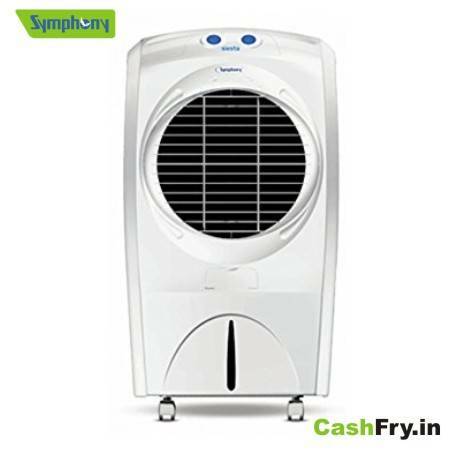 There are several models of Symphony Air Coolers at Amazon.in. You can choose any of them. It is good for the room size of area up to 370 Sq Ft. There is an Easy Returns policy for this product. 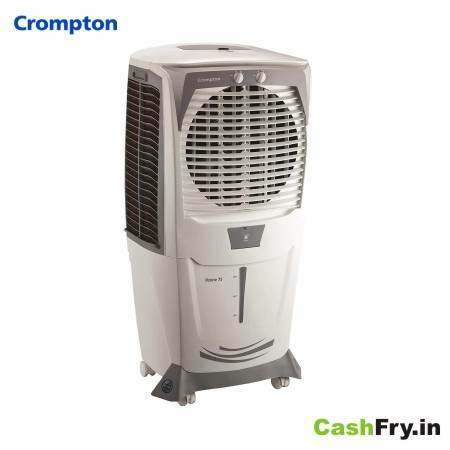 There are several models of Crompton Air Coolers at Amazon.in. You can choose any of them. It has Capacity of 75 Litres. It is good for the room size of up to 550 Sq Ft. It is 190 Watts cooler. There is Easy Return Policy.